Master the concepts required to pass with integrated videos, streamlined content, chapter and comprehensive exams. Our online course is designed to ensure you pass your state exam on your first attempt. Licensed life and health insurance professionals are empowered to confidently provide security and peace of mind to their clients by assessing their needs and identifying a full range of insurance products to protect their assets in the event of death or deterioration of health. Life and health insurance consultants charge a specific fee to research insurance policies, answer questions, provide advice and make recommendations to clients. To become licensed as a life and health insurance consultant, you will need to demonstrate entry-level knowledge of the industry by passing a state licensing exam. This course will deliver the content needed to successfully complete the education and examination requirements. Types of life insurance policies, annuities, qualified and non-qualified retirement plans, medical expense and managed care plans, disability income and long-term care insurance, Medicare, Medicaid, and Social Security benefits, group life and health insurance, policy provisions and applicable riders, the application and underwriting process, federal tax considerations and federal initiatives under the Affordable Care Act. This course also includes an overview of general insurance concepts, insurance contract terminology, and state-specific regulations based on the state where you are applying for a license. Watch, read, and listen to curriculum developed by industry experts & cross-referenced with the exam content outline. 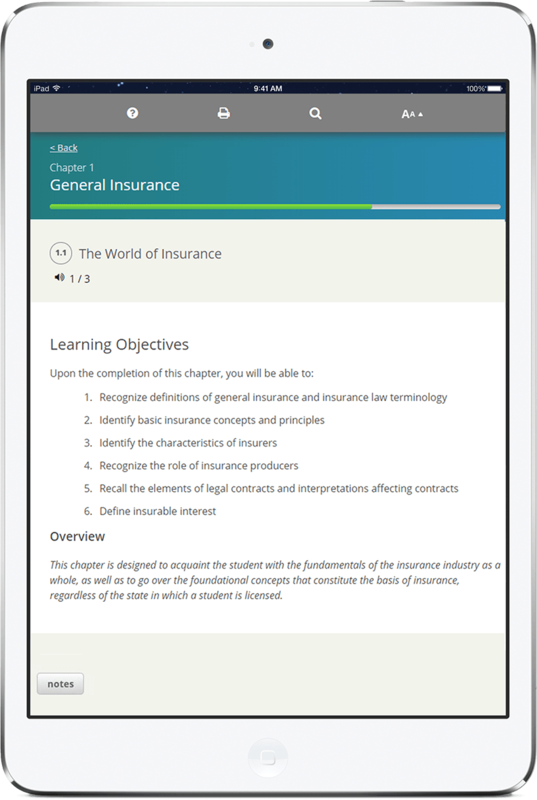 Test your knowledge with retention questions, activities, chapter quizzes and simulate your licensing exam. Pass your exam on the first attempt with courses trusted by the nation's top banks and insurance companies. Watch, read, and listen to curriculum developed by industry experts. "Wonderful, well organized course. Really appreciated it! The practice tests did a good job of preparing me for the real test." Prefer a different way to study? We've got you covered. Learn from the experience of an instructor in a classroom setting. This opportunity is only available in select cities. Looking for a more interactive learning experience? Learn from an instructor in the comfort of your own environment. Use additional learning tools to study at your own pace with a study manual or other study materials. Partner with A.D. Banker and simplify your licensing process. Request course packages, enroll students, and track them each step of the way.